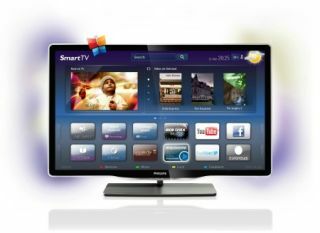 IFA 2011: Philips and LG join forces for Smart TV | What Hi-Fi? The Smart TV consortium of Philips, Sharp and Loewe has reached an agreement with LG to develop an all-new, Smart TV platform. The deal seems to be in the early stages, with Philips explaining that they're 'investigating the specification of common technical requirements for their Smart TV offerings'. The main aim seems to be to reduce the time and money spent by software developers on optimizing and testing apps for different platforms. The savings there should then lead to more and better Smart TV apps. The first step is apparently going to be the introduction of a beta version of a common Software Development Kit in November. On stage at IFA, Robert Smits, General Manager of TV at Philips, invited other Smart TV manufacturers and app developers to join this new initiative. In a statement issued this afternoon, LG added that it had agreed to work with Philips, Sharp and Loewe "to define common technical reqirements for smart TVs, based on open standards such as HTML5, CE-HTML and HbbTV". Havis Kwon, president and CEO of LG, says: "By working in partenership with two innovators in TVs, we've taken a major step towards creating an app market every bit as inventive and dynamic as theone that exists for smartphones."